Exclusive – Talk about a halo effect. Kik, a developer of cross-platform mobile communication apps, says something really strange happened when they launched their Windows Phone 7 application last June: user growth across the iOS and Android platform both accelerated significantly. 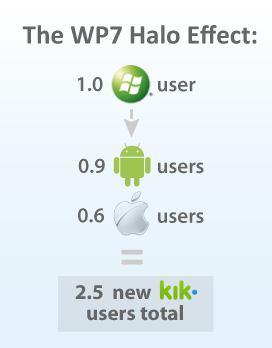 Turns out every registered user of the Windows Phone 7 Kik Messenger app is ‘worth’ 2.53 users (see explanation on methodology and accompanying image below). Windows Phone’s market share may be low (according to Millennial Media, only about 2 percent of the U.S. market – PDF) but for venture capital-backed Kik, it was definitely worth launching on the platform. According to the company, Android and iOS user growth was actually 22 percent higher than anticipated following the launch of the WP7 app. What Kik did to come up with the numbers was tracking the average user growth on iOS and Android for five weeks before the Windows Phone 7 Kik Messenger launch on June 28, 2011, and subsequently comparing this trend to the month following the launch. The company found that, in addition to the expected average growth on Android and iOS, the platforms were experiencing that 22 percent bonus in growth as a result of the launch. Each Windows Phone user brought an additional 1.53 users of iOS or Android, netting a total of 2.53 registered Kik users. “Windows Phone users may be a small segment of the whole, but they bring with them all their friends on other mobile platforms, creating a huge and unanticipated spike in Kik activity.